Hey hey! 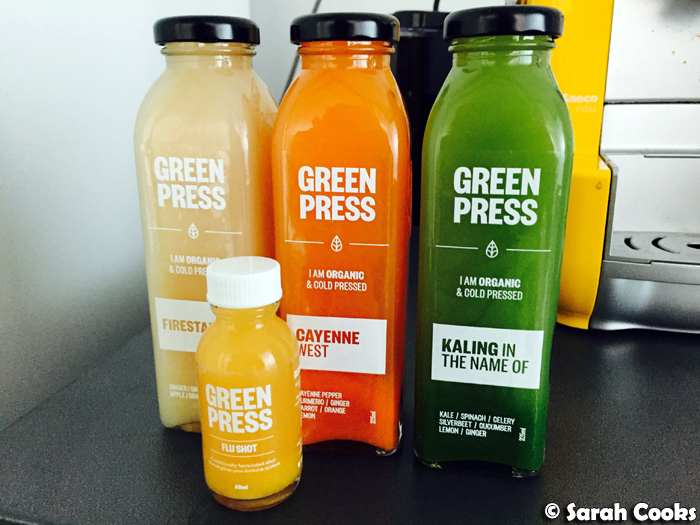 So, my latest obsession is Green Press! (Much healthier than my previous obsession with Short Stop, and more chilled than my previous obsession with Thr1ve!) 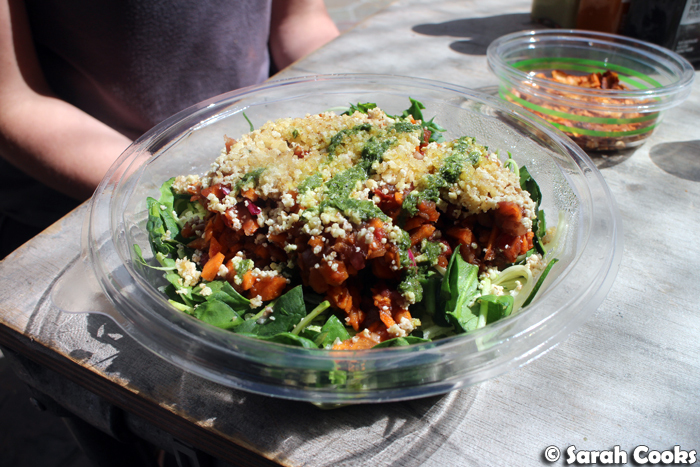 These guys are located in the Spencer street end of Little Collins Street, and specialise in cold pressed juices, açaí bowls, smoothies, salads and other health-focused-but-still-tasty treats. Paleo? Gluten free? Grain free? FODMAP-friendly? Exclusion diet that a nutritionist or doctor has put you on for some reason? They've got you covered. 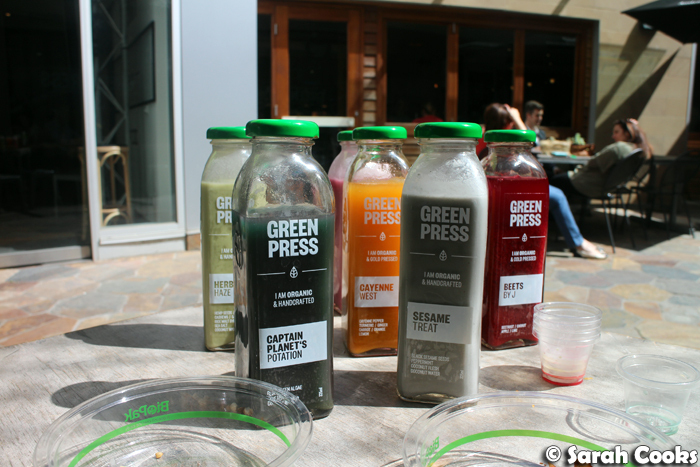 I was invited along to Green Press back in March to try some of their juices, and since then I have become deeply obsessed with their products, despite the total absence of any dietary requirements on my part. While we were chatting with manager Jo, she brought out their house-made coconut bacon and their granola for us to nibble on. The coconut bacon didn't taste particularly bacony to me, but was more like a crunchy smoky coconutty snack - something you could eat instead of (or with!) nuts and chips in front of the TV. 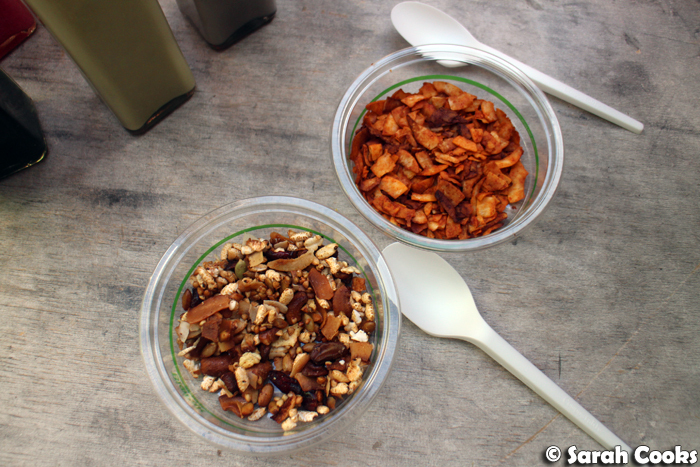 The Green Press granola, however, was incredibly delicious! There's an addictive pop of salt in it, and heaps of sweet and crunchy goodness - buckwheat, rice puffs, coconut flakes and more. Seriously good! I couldn't stop picking at it the whole time we were there, and I bought a pack to take home with me as well. (I have since been back a couple of times to buy more of that granola - deeeeelicious). 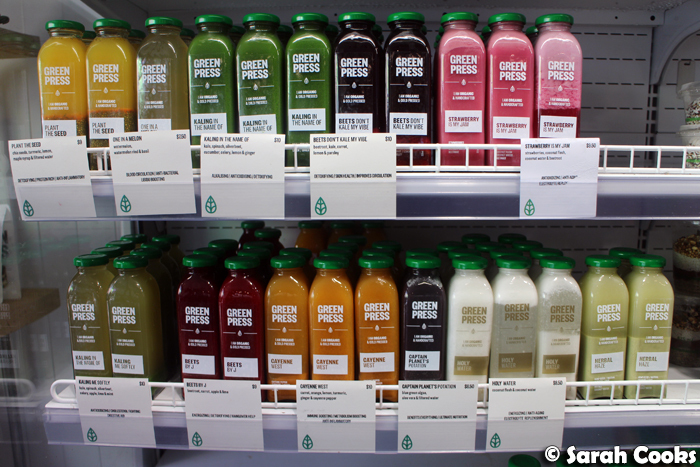 We were given a selection of juices to try, and I was impressed with the variety of flavours on offer, and how each juice had its own distinct taste. 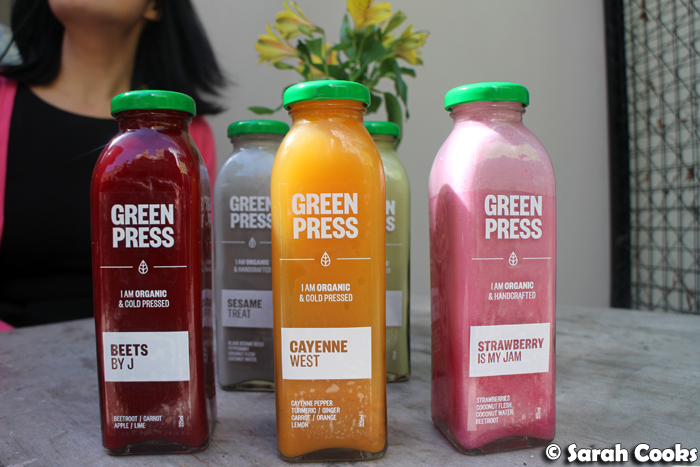 They seem to create new flavours reasonably often, but there always seems to be a selection of green juices, savoury tasting vegetable juices (the "Cayenne West", with cayenne and turmeric, is genuinely spicy! 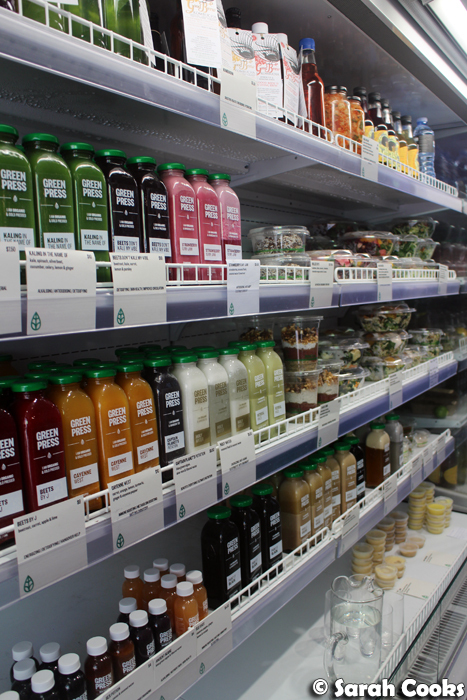 ), nut milks, sweeter coconut-water based juices and more. I also tried the raw zucchini "pasta" with raw tomato sauce, which I chose because I love raw zucchini, but also because I was curious to know how a raw tomato sauce would taste. Spoiler alert: it was great. The sauce was tasty, with a rich tomato flavour, and the salad overall was very nourishing, with the added smug-inducing-goodness of eating a whole bowl of vegetables! I'd seen nutritional yeast in health food stores before, but had no idea how it's supposed to be used. What it does is replicate the umami flavour that you'd get in Parmesan cheese - so combined with walnuts it makes walnut "Parmesan". Ta-dah! 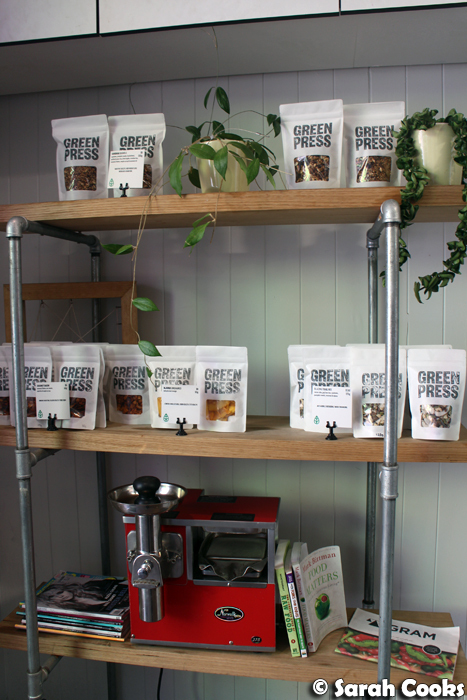 After that visit, I've become a regular customer at Green Press. I've never been a big juice person (always water for me, sometimes Coke Zero, and often Champagne), but I think I like these a lot because these don't taste as sweet as regular supermarket juice. I also like the novelty factor of the unusual flavours. (Whuuut... blue green algae and coconut water? Must Try!) Being organic and cold pressed, the juices are quite expensive, at $8.50 to $10 a pop, so I've tried to limit my Green Press consumption to when I'm feeling run down and craving a vitamin hit. Although I must say I have noticed that my excuses have become more flimsy as time has gone on, especially since I downloaded their loyalty card app that lets you track points online and redeem free juices when you accumulate enough points. "I sneezed today! Time for a Green Press run!" (Mecca Cosmetica have a similar loyalty program with which I'm equally obsessed, but the less said about my cosmetics spend the better). The above selection of juices were purchased last week when I was worried I was coming down with a cold - Sandra visited the shop and basically bought everything that might help immunity. I have bought all of these juices separately a number of times, but I think they look especially pretty all lined up together. Colours! So, the "Flu Shot" is a ridiculously spicy mixture of lemon, ginger, cayenne pepper and orange (there's a reason it's not a full-sized juice!) The "Firestarter" is basically buttloads of ginger with a little apple and grapefruit to soften it. Again, very spicy. The "Cayenne West" is a mixture of citrus fruits, carrot, ginger, turmeric, and very spicy cayenne pepper. Intense! "Kaling in the Name Of" is emphatically a green juice, and despite containing my three most-loathed vegetables (kale, celery and silverbeet), actually tastes pretty mild. I was worried it would be super bitter, but it's not - phew. 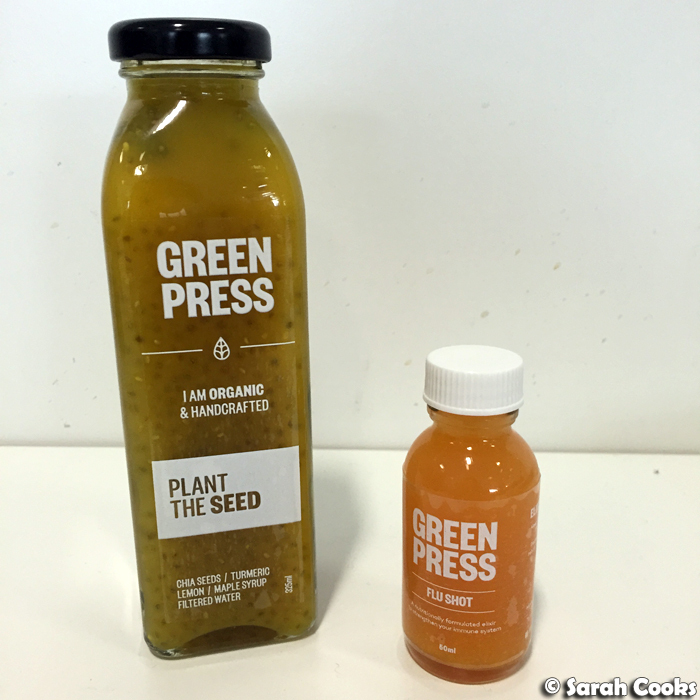 (Check out Green Press' Instagram to see what goes into one bottle). They also do a milder version, "Kaling Me Softly", that has apple, lime and mint added to mellow out the flavours. The service worked really well, with my order arriving within the designated window and complete. Boom. That "Captain Planet" juice is made of blue-green algae (apparently it's full of vitamins and minerals) and coconut water - despite the intense colour, you can't taste the algae. 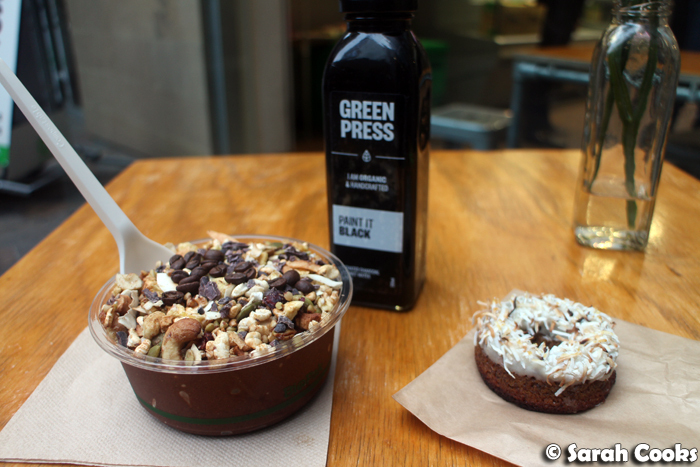 Finally, I popped into Green Press early one morning because I wanted to try one of their açaí bowls. While I was down there, I got a hectic "Paint it Black" juice (activated charcoal, coconut water and lemon - looks intense but just tastes like coconut water) and one of their vanilla Krispy Klean donuts for later. (These are made from pumpkin and flax and are gluten free, refined sugar free blah blah blah - but I just like them because they taste nice - small, sweet, moist little cake with a nice hint of spice). 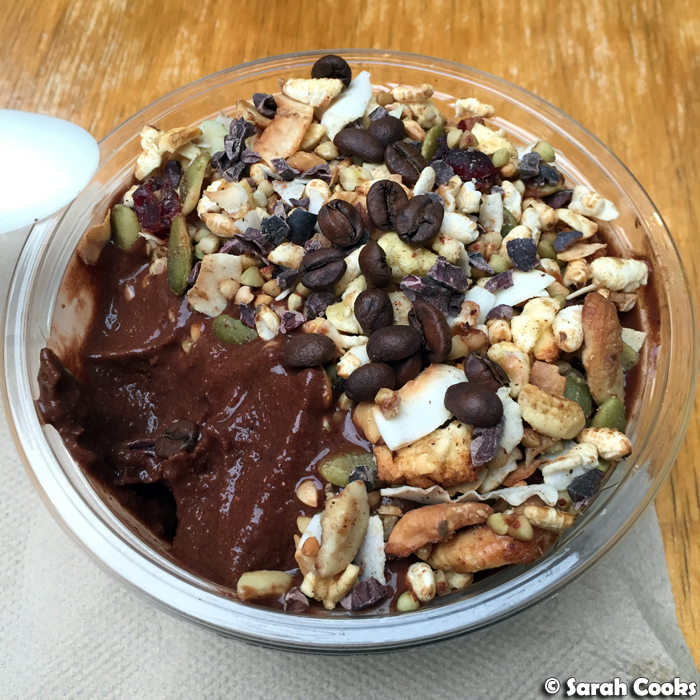 I got the coffee snob açaí bowl, which isn't on the menu, but is a secret Instagram item that you need to ask for. (Probably helps if you give them a sneaky wink when you order as well). Basically it's a regular açaí bowl, with all its frozen, creamy antioxidant-y goodness, plus a double shot of cold drip coffee and raw chocolate, covered with their fab granola and some coffee beans. What a way to kickstart the morning! As you know, I eat a lot of açaí bowls - and I've been told that I tend to get just a little bit chirpy and hyper after I eat them. Well, this açaí bowl was double the size of the ones I make at home, and had a double shot of coffee in it. And it happened to be breakfast on my last day at work before my trip to Germany. Sorry to all my coworkers! 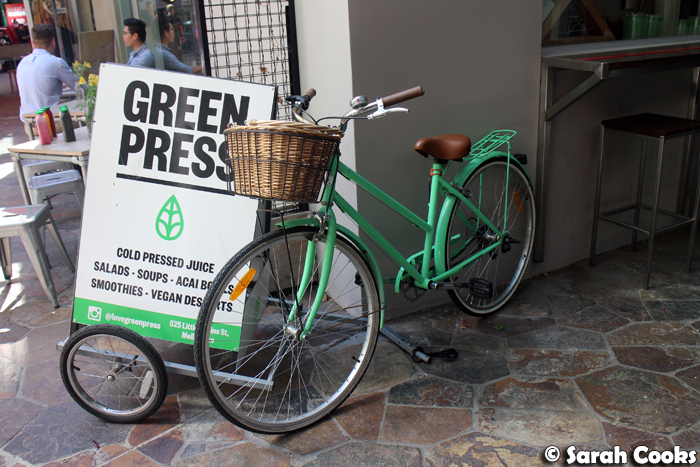 Incidentally, Green Press' Instagram is pretty cool - apart from the usual promotion and regrams, they'll let you know about different specials they have, and they post their healthier makeovers of desserts and treats (Banoffee Pie! Twixes! Kingston biscuits! 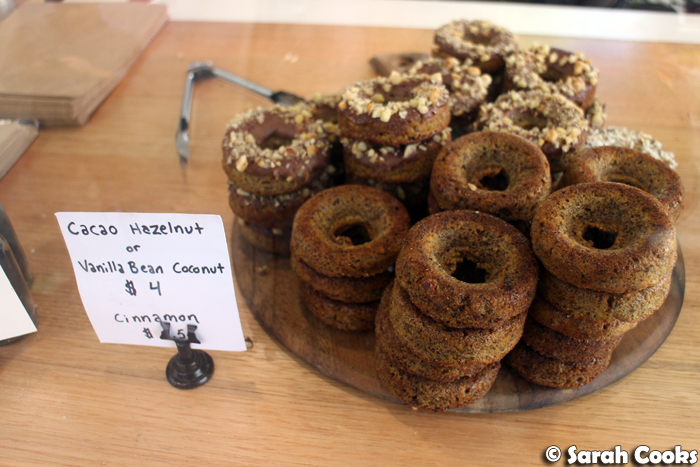 ), which, as a keen baker, I find very interesting. Do you juice? 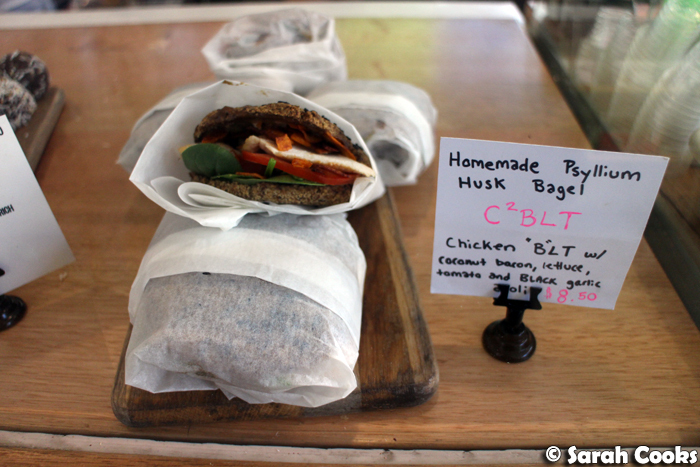 There are a lot of health-focussed cafes popping up around town right now - do you have a favourite? 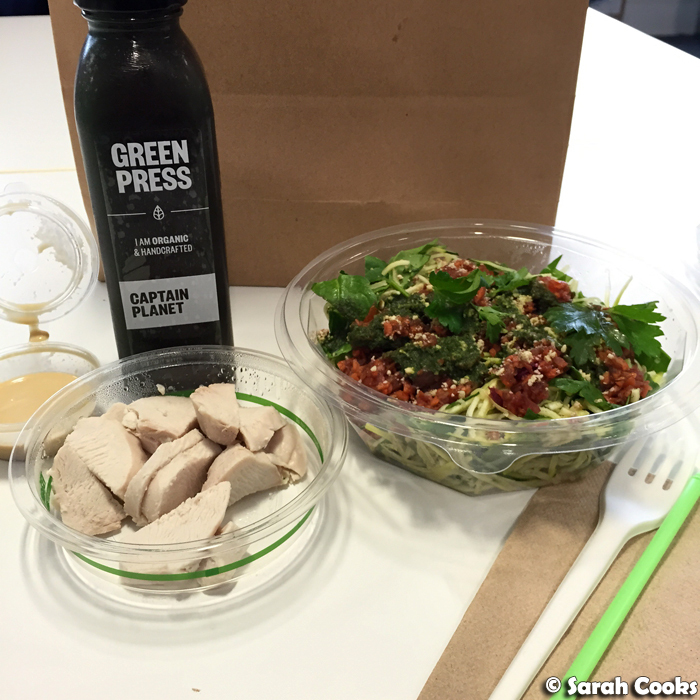 Sarah first visited Green Press on an invite, and has since become a regular customer because she loves it! Interesting! I like doing my own juice blends because I've tried some brands and they're not quite to my taste. I don't think I've seen this brand in Sydney though (but I could be mistaken, I don't drink that much juice). I found the same with coconut bacon. I made it and it was fine but best as an ingredient rather than a snack by itself.